Whether you're a dust-and-go gal or after more serious coverage, we've got what you need for skin-perfecting flawless foundation! We love hearing how much our foundations have helped change and beautify your skin so let us know what your formulation of choice is and what you love about it! I'm a Pressed Base + Bronze in sunkiss girl and am absolutely obsessed with Moist Hydration Mist and Face Primer! 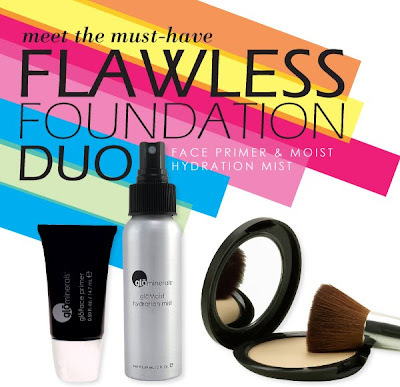 This prime and mist duo makes for complexion perfection. Here are some tips from our experts on great ways to use Face Primer and Hydration Mist. If you haven't tried them, do - you'll become a believer too! Face Primer creates an even, ideal canvas for foundation by filling in fine lines, wrinkles and large pores so that foundation goes on porcelain-smooth and stays put all day long. Blend with Sheer Tint Illuminator, Highlighter or Brightener Highlight Concealer and apply to cheekbones, brow bones and any other features that you wish to highlight, prior to foundation application for subtle illumination. Mix with a bit of Sheer Tint Base to create a slightly tinted primer that gives a gorgeous, healthy glow. Use the Texture Brush to whip together with Sheer Tint Illuminator and apply for airbrushed perfection and a subtle glow. Moist Hydration Mist sets makeup and provides immediate hydration for the skin with a special blend of D2O (heavy water), hyaluronic acid and antioxidants. Spray on Liquid Foundation Brush before applying Protective Liquid Foundation or Sheer Tint Base for smooth application. Mist skin prior to any foundation application to hydrate and give foundation a more polished look. Mist skin throughout the day to revitalize your makeup - minerals love moisture so a little spritz will help you look touched up without having to reapply makeup. 2oz size is fab for carry-on travel to refresh during your next flight.